Should I (or my mom) be worried about calories? So, this week I've been meeting my goal of waking up earlier (yay! ), but in doing so I've been STARVING throughout the day. The past few days I've been eating large meals and snacking every few hours. I use LoseIt to track my food, and it's been showing that since I've been waking up earlier, I've been eating between 2,000 to 2,200 calories a day (I'm a 20 year old, 110 pound female - LoseIt says I should stay under 1,800 to maintain my weight). Should I start restricting my calories to what LoseIt recommends, exercise it off, or just not worry about it? My mom (54 years old, she won't tell me her weight) has recently decided to jump on the paleo bandwagon. She uses LoseIt too, and is convinced that because she's older and has a slower metabolism, she only needs 1,400 calories a day or less. I'm worried that she's going to get into the whole vicious cycle of feel starving, binge, feel guilty, restrict more, repeat... I want her to be happy and satisfied while losing weight! Should she increase her calories, or stay at 1,400? Maybe you should wean her off of it and steer her toward something that doesn't put calories front and center. A copy of *Why We Get Fat* could be pretty useful, too. Hey Jenna, thanks for your comment. I really like seeing what other people eat in a day. :P I used to eat kind of like you, it's only just this week that I've been waking up early that I've been so hungry! Thanks Ten Bulls! I mostly do use LoseIt to track macronutrient ratios, I was just wondering if i should be more concerned than I am about calories (which is not much, haha). I do 60% fat, 20% carbs, 20% protein, and get an average of 80g protein and 100g carbs. So pretty good, looks like. :) Maybe I should tell my mom not to use LoseIt anymore? LoseIt is a really slick app that I used a lot in the past, but it's not really that beneficial because you should be focused more on macronutrient ratios than calorie counts. 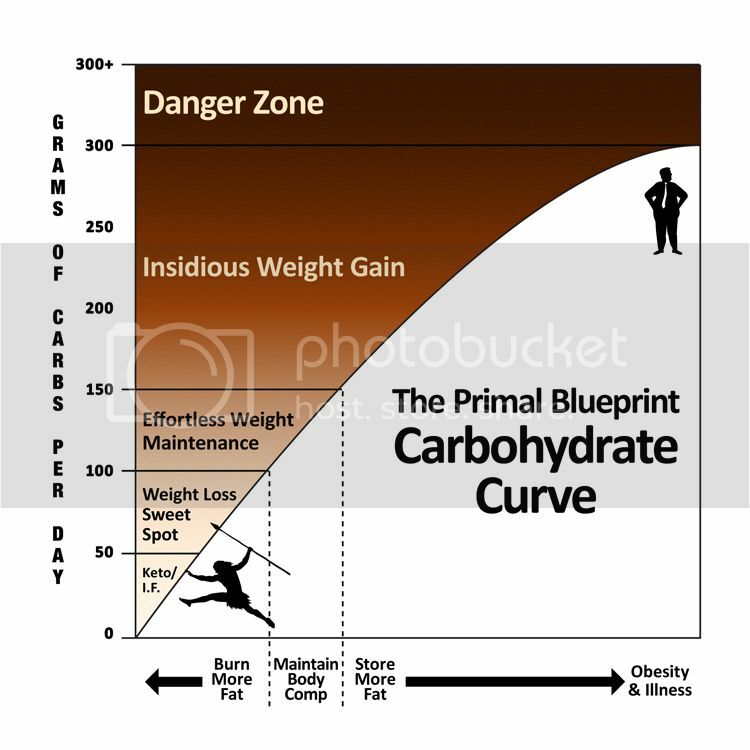 If your main goal is to lose weight, go for low carb or ketogenic carb levels. Roughly speaking, between 20-90 grams per day. I'm assuming based on your weight that you're more interested in weight maintenance. If that's the case and you eat low carb paleo and get reasonable amounts of exercise, you probably don't need much in the way of food tracking. Just keep an eye on your body fat and adjust your carbs down if you start gaining weight. If you just like to know your numbers, try Cron-O-Meter, which is much better about macronutrient ratios than LoseIt. This goes double for your mom, who I'm assuming is mostly trying to lose weight. Carbs are practically the only significant factor in losing age-related weight. She'd be better off not counting calories at all and overeating on fatty meat than trying to starve herself. Under no circumstances should you or your mom limit calories to the point where you feel particularly hungry. It's counterproductive and based on bad science.You're much better off eating until you're full on low-carb foods and letting the caloric chips fall where they may. What my wife does is she uses Cron-O-Meter to make sure she's not getting excessive carbs somewhere and to ensure she's getting sufficient protein. She notes her calorie count to see if it goes above what she has found is a reasonable baseline, and watches for unusual spikes or slow increases. But she never, ever lets herself go hungry just because she's exceded her calorie count. Eventually, that stuff takes care of itself. If you have problems being satisfied without eating huge amounts of food, be sure you're eating enough protein. At 110 lbs, you should be getting something like 85 g of protein per day, depending on what kind of exercise you get. In terms of your intake, you must have such a fast metabolism or be doing so much exercsie to be so starving at that weight? I'm early 20s, 115lbs, naturally thin with a fast metabolism. I get really hungry and have to eat every 1-2 hours, but stuffing myself full of (95%) paleo food, I never need to go over 1400-1500 cals max. It's usually around 1200. I don't necessarily count them, but I know (from old habits in my past) approx what I'm eating eevery day. Breakfast: Carrot, celery and apple juice (130 cals) and a coffee (skinny mocha - only non-paleo thing in my day) (170 cals) Lunch: Tuna and salad or left-over dinner (max 300 cals) Dinner: Some variation of meat (red meat/white fish/salmon/chicken) and salad or roast vegies (400 cals) Snacks: Mixture or all of 100g fresh blueberries and/or strawberries (30 cals); vegetable sticks (celery/capsicum/cucumber) (40 cals); 50-100g sliced turkey (501-100 cals); 25g mixed nuts (150 cals); half an avocado (160 cals) etc. I would assess where the bulk of your less fulfilling calories are coming from (fruit, potatoes etc) and perhaps reassign them to fat (coconut oil, avocado, nuts) so that you would feel more satiated?